Capacitors are electronic components that store electric energy and discharge it rapidly. Unlike batteries, they’re built to store and discharge energy rapidly. Every capacitor comprises of a dielectric and two electric conductors. The dielectric acts as an insulator between the conductors. When a source of electric current powers the conductors, a field of static electricity is generated and stored around the dielectric. With that said, what’s the use of a capacitor in car audio? Car audio capacitors are used to prevent dimming of dash lights and headlights when playing loud bass notes. They work by supplying the car amplifier with rapid jolts of power. But how would you get to know the best capacitor for your car audio? It’s simple. Read on through this article for a review of the top 7 best car audio capacitors. 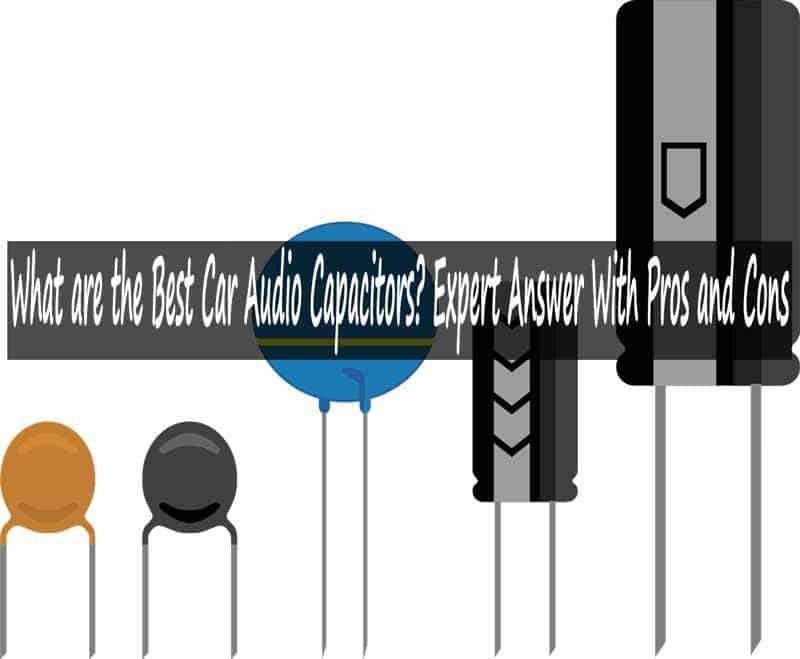 This buying guide will assist you in making a more informed decision upon knowing the features, pros and cons of the top 7 best capacitors for car audio. We have interviewed many car owners who complain about dimming headlights and dash lights when blasting their music. They always wondered how they could fix this problem. Well, from our research, all they needed is installing a car audio capacitor. With a little investment, they installed car audio capacitors and are no longer experiencing the problem of dimming lights. Also, we have done analysis from existing research on car audio capacitors to have deeper understanding about the features that a good capacitor must have. Most noteworthy, we have gathered reports from product experts to know more about the performance of different capacitors in the market. Results of our research shows that different car audio capacitors perform differently. As a buyer, you need to know the best audio capacitor for your car. This is where this review comes in handy. It has everything you need to know as a buyer regarding the best car audio capacitors. Planet Audio PC10F boasts of being one of the best 10 Farad car audio capacitors. It’s unique in that it supports a capacitance value of 10 farads. This means that it can store and discharge more power than its main competitors. Hence, it can power more powerful car amplifiers than rival capacitors. Illuminated LED display: First of all, Planet Audio PC10F car audio capacitor comes with a digital, LED voltage display with three digits. The illuminated LED display makes it easy to know the current voltage of the capacitor, such that you can easily tell when it’s either full or running low. Audible tones: Another key feature of this capacitor is that it has audible tone for overvoltage, low voltage and reverse polarity. The audible tones alert you whenever the capacitor experiences unfavorable conditions such as overvoltage, low voltage and reverse polarity. High working voltage: Moreover, the capacitor features a working voltage of 16 VDC and a surge voltage of 24 VDC. Its support for higher voltage than standard ratings means that it’s protected from overvoltage and power surge. Attractive finishing: In addition, the capacitor comes with an attractive black, chrome finish. The black, chrome finish makes it blend easily in almost any interior car finish, regardless of the color and style. High capacitance: Finally but not least, the capacitor feature a capacitance value of 10 Farads.This means that this capacitor has higher power storage such that it can power amplifiers for longer periods than capacitors with lower capacitance. Our Verdict: Planet Audio PC10F capacitor is ideal for car owners who need to power more powerful car stereo systems. Although it’s a little more expensive than some of its competitors, it worth its price considering its higher capacitance. BOSS Audio CPBK2-2 is a 2 Farad audio capacitor. It’s unique for its compact size and weight, making it one of the smallest, yet a reliable capacitor in the market today. Its small size makes it less visible upon hooking up in your car stereo. Its compact design makes it easier to fit in even the smallest spaces. Three digit display- First and foremost, this capacitor comes with a red, three digit voltage display. The red display makes it easy to see the current voltage even while in the dark such that you can easily tell when it’s full or running low. Warning tones- The capacitor also comes with the capability of audible warning tones. The audible tone alerts you in the event of reverse polarity, low voltage and overvoltage. Remote terminal screws- It features remote terminal screws on the head. The head terminal screw makes it easy to hook up when charging or connecting it to your car stereo. Fast charging- Since it’s a 2 Farad capacitor, it only takes seconds to charge. This means that you can charge it very quickly as needed. Light weight and compact- It is compact in size with a low unit weight. This makes it fit easily in the smallest spaces and its lightweight nature makes it effortless to hookup. Our Verdict: BOSS Audio CPBK2-2is one of the best capacitors for car audio on the lower price tag. It’s most ideal for car owners with a tight budget and less powerful amps. It will surely offer you the convenience you need, thus consider it in your shortlist. The Sound Storm C22 capacitor is yet another great capacitor. Its key unique feature is its chrome plated posts. The chromium plating gives the posts a decorative surface finish. It also enhances the resilience of the posts. In addition, chromium plating makes the posts stronger and more durable. Surge protection- A high working voltage of 16V DC and surge voltage of up to 20V DC. Its high working voltage means that it can work efficiently under higher voltage and its surge voltage of 20V DC means that it’s protected from high voltage. Quick to charge- The capacitor has a capacitance value of 2 Farads. The lower capacitance value makes it quick to charge such that it will power your car stereo amp within no time. Digital display- It features a red voltage display that displays current voltage in three digits. The red voltage display enables a user to check the voltage of the capacitor without using any special voltage measuring tools. Chrome plating- The Sound Storm C22 features chrome plated posts. The chromium plated posts have enhanced strength and durability, in addition to decorative finishing. Mounting brackets- Mounting brackets and other mounting supplies are included. Thus, you will not have to invest any extra money with mounting supplies. Our Verdict: If you really need a medium priced capacitor for your car stereo that charges pretty fast, then you can add Sound Storm C22 in your shortlist. It’s ideal for anyone with less powerful amplifiers. The Stinger SSCAP2M is yet another great capacitor. Its main unique feature is its aluminum brushed casing. The brushed aluminum body is light, yet durable. Moreover, brushed aluminum is more attractive than standard aluminum. In addition, aluminum resists corrosion and is more resilient especially in colder environments. Aluminum body- The Stinger SSCAP2M car audio capacitor features a brushed aluminum body. Like previously mentioned, its brushed aluminum body enhances its resilience, strength and durability. Great display- This capacitor also features a three digit digital display. The voltage display enables a user to view the current capacitor charge and its red digits makes it more visible even at night. Reverse polarity alerts- Another most noteworthy feature of this capacitor is its audible reverse polarity alerts. The alerts will notify you whenever there is reverse polarity due to improper wire connections. Charges fast- The capacitor operates on a capacitance value of 2 Farads. Thus, it charges very quickly in readiness to power your car audio amp. Satin terminal finishing- The Stinger SSCAP2M features satin finish terminals. Satin finish is beneficial in that it does not show any flaws on terminals and you will always miss to see any gouges on the terminals. Our Verdict: In case you’re searching for one of the most inexpensive yet reliable capacitor for a car music system, then you need to check out Stinger SSCAP2M on Amazon. Consider it in your shortlist give your car amp more power. One of the most notable capacitors is the Rockford RFC1. It’s a 1 Farad capacitor with a unique feature of having a platinum plated body. Plating the capacitor body with platinum enhances its hardness. This makes it more durable and less prone to surface damage. For instance, it’s not easy to scratch a platinum plated capacitor. Platinum plated- As stated earlier, the Rockford RFC1 capacitor features a platinum plated body. This enhances its overall strength, making it more durable for it resists surface damage. Solid brass top- Its top comprises of solid brass, which is known for its resistance to corrosion and tolerating high temperatures. The solid brass top assists in reducing stripping and also makes it possible for the capacitor to work efficiently despite any rise in temperature due to resistance while powering a car audio amplifier. Low ESR- The capacitor has low equivalent series resistance. The low ESR means that it does not overheat easily regardless of the operational duration. Rapid charging- Rockford RFC1 has a capacitance value of 1 Farads. The low capacitance value makes it possible to get a full charge quite rapidly. Great color finishing- It features a silver primary color and a black secondary color. This make it blend well in almost any interior car finishing. Our Verdict: Rockford RFC1 capacitor is ideal for any car owner who needs a capacitor that can charge quite fast and one that can perform remarkably despite working under high temperatures. Although it’s a bit more expensive, remember quality matters. The Soundquest SQCAP2M is yet another affordable 2 Farads car capacitor. Its key feature is the brushed aluminum body. The finishing is highlyauthentic and decorative for a capacitor of its price range. Brushed aluminum capacitor body makes it weather resistant, thus it is ideal for use in a car environment. Brushed aluminum- Like already mentioned, this capacitor features a brushed aluminum body. It makes the capacitor more resistant to weather elements and also makes the capacitor look authentic and decorative. Polarity warnings- The capacitor has reverse polarity warnings in form of audible alerts. The warnings alert the user about any reverse polarity such that the problem can be rectified immediately before it damages any components. Satin terminals- In addition, the capacitor has satin finished terminals. Satin finishing makes the terminals resist moisture such that the capacitor can remain functional even in a humid car environment. Voltage display- Moreover, the capacitor features a red, 3 digit display. The display shows the current voltage level of the resistor such that you can easily tell when it’s about to demand charging. Surge protection- It has a surge capability of up to 20 volts DC. This means that this capacitor has surge protection of up to 20 volts DC. Our Verdict: Considering its great features, the Soundquest SQCAP2M is a good option at its affordable price tag. Thus, it’s ideal for anyone with a tight budget, yet it offers all you need in a capacitor for your car stereo. Power Acoustik PC1.5F boasts of being an average priced 1.5 Farads capacitor. It’s most noteworthy feature is automatic shutoff protection. This enables the capacitor to shut off the charging electric current whenever it’s fully charged. Automatic shutoff protects the capacitor from damage that may result from voltage overload. Standard range voltage- The capacitor operates within 12 and 16V DC. This makes it operable within the standard car DC voltage. Clear display- Power Acoustik PC1.5F features a red, digital display. The display allows the user to view the current voltage charge in the capacitor without using an eternal meter. Aluminum finishing- It comes with a brushed aluminum finishing. The finishing makes it look decorative while still making it resilient and corrosion resistant. Translucent mounting brackets- The capacitor features translucent mounting brackets. They make it effortless to install the capacitor and their translucent nature makes them less visible once fitted. Easy mounting- It features a single mounting post. The single mounting post makes it quite easy and fast to install the capacitor in your car amp. Our Verdict: The capacitor is worth its middle price range, considering its great features. If your car amp does not demand a lot of power, this capacitor will be good enough and you’ll surely appreciate what it has to offer. Capacitors for car audio systems are not designed the same way. Different capacitors have different features. They have different pros and an equal share of cons. Thus, a capacitor that works for one car audio system may not work effectively in another car audio. Therefore, you’ll want to choose the best capacitor for your car to get the most out of it. But how would you choose the best capacitor for your car audio? Well, there are some consideration you need to think about before making your final decision. The capacitance value rating of a capacitor describes the charge that a capacitor can store. Capacitance value is represented in Farads. The higher the capacitance value, the more powerful the capacitor. Before buying a capacitor for your car audio, consider the power of your car amplifier. If your car amp is rated less than 2000 watts, a capacitor with a capacitance value of 1 to 2 Farads can suffice. However, if you have a more powerful car amp, then consider a capacitor with a higher capacitance rating for the best performance. Different capacitors have different rated voltage. In general, most car batteries and alternators produce a voltage of 12 to 14.8V DC. Thus, you’ll want to consider a capacitor that can handle up to 16V DC rated voltage. The surge voltage should be on the higher side. A surge voltage rating of around 20V DC should suffice to ensure your capacitor does not get damaged in case of sudden voltage surge. Each and every capacitor has a maximum voltage level it can take. Exceeding the maximum voltage may damage the capacitor. Also, low voltage can damage the capacitor. Thus, consider a capacitor with both voltage overload and low voltage protection to increase the chances of using it for more years to come. If you can get a capacitor with automatic shutoff, the better. Another factor to consider is how easy it is to charge the capacitor. You wouldn’t want to invest in a capacitor that takes too long to charge or is complicated to charge. Also, consider how easy it is to connect the capacitor to your car audio system. It should be effortless to connect or disconnect. Moreover, it should come with mounting hardware, including mounting brackets and screws. While driving, you might not always check your capacitor for charge level with the aim of driving safely. Thus, you should invest in a capacitor that can give you audible alerts for unfavorable conditions such as low voltage and overvoltage. Also, consider a capacitor with reverse polarity alerts. It’s ideal to invest in a capacitor that has a LED voltage display to easily know the current charge level of the capacitor. A LED voltage display eliminates the need to use voltmeters which only make it more challenging to use a capacitor in your car audio. Whenever investing in any product, you’ll always want something that can serve you for many years. The same case applies to buying capacitors. It’s ideal to consider the material and finishing of the capacitor. Choose a capacitor made of a material and finishing that can resist corrosion and weather elements. The end terminals should also be made of a strong material that resists abrasion. Well, it’s obvious that your budget determines the type of capacitor you can afford. Some capacitors cost more due to extra features while others are more affordable due to limited capacities. At the same time, it doesn’t mean that affordable capacitors don’t have great features. However, you will not want to buy a capacitor just because it is cheap. You also need to consider its quality. Thus, you should consider balancing price and quality. Always avoid compromising quality of the capacitor over cost. Hence, consider a capacitor that has the features you need and is within your budget, else stretch your budget a little bit. In conclusion, the final decision you’ll make when buying the best capacitor for your car audio should mainly depend on the quality, features, and budget. Avoid choosing a capacitor for your car audio just because it looks attractive or it’s extremely affordable. Go for a capacitor that has all the features you want and is within your budget. Although the capacitors mentioned in this guide have their similarities and differences, including different pros and cons, they have their unique features. Each of these capacitors has an outstanding feature that sets it apart from the other capacitors. As long as you choose a capacitor that is powerful enough to power your car audio amplifier, you’ll be good to go. You’ll rest assured that your car’s headlights and dashboard lights will never dim whenever playing bass notes in your car audio system. Hence, with these tips and guide in mind, you will stand better chances of investing in the best car audio capacitor.